The electric power industry is driven by boom and bust cycles as market fundamentals and volatility sends signals to market participants to speed up or slow down their efforts. 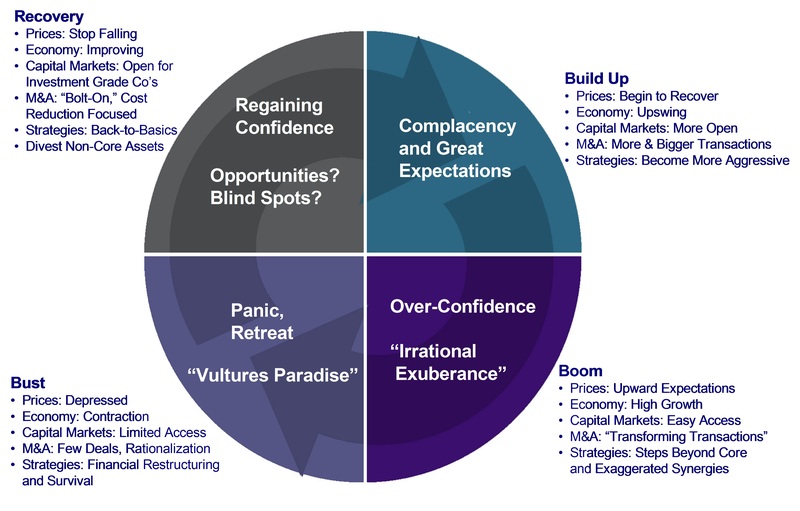 One of the lessons of that boom and bust experience is that seeds of the next boom are sown in the bust of the last business cycle. By that I mean the enthusiasm of the boom stage of the market always attracts new entrants and leads to excess which volatility increases before the fundamentals of supply and demand swing back toward equilibrium. 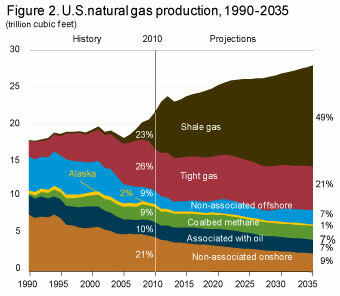 This phenomenon is shows clearly by the graphic above from the US Energy Information Administration data which shows that huge spike in natural gas fired stage— those thousands of megawatts of gas fired generation did not go away in the bust. They got flipped or sold, they went bankrupt and were written off and sold to new owners. Their owners partnered with renewable energy developers to provide back-up generation or they are sitting out there under utilized ready for the recovery and build up stages ahead. During the depths of the recession about the only thing being built was renewable energy wind or solar projects supported by stimulus money and state renewable portfolio standard demands. 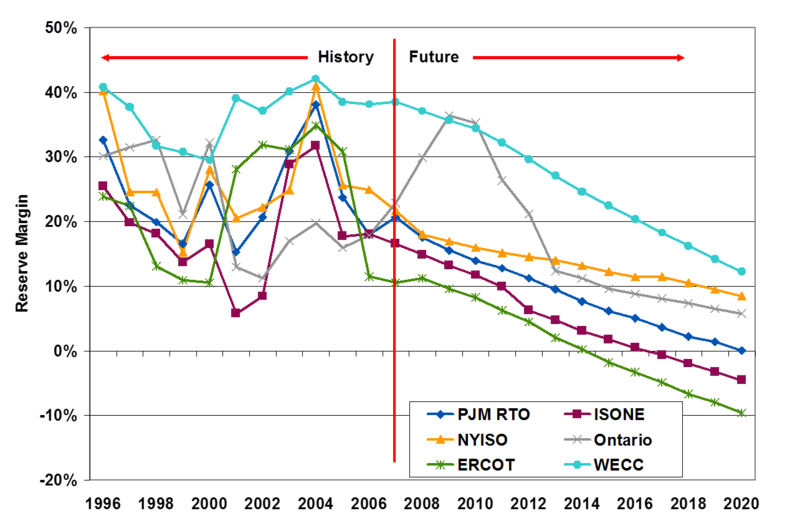 Despite all the growth in renewable capacity reserve margins are falling across regional markets. The long lead time needed to build new power generation or transmission combined with tightening reserve margins is a signal of change in the power business cycle. The Nuclear Regulatory Commission recently approved the construction of two new baseload nuclear power plants in Georgia. These are the first new nukes since 1978. The process of getting to this NRC approval began more than a decade ago. And even now it will take another 3-5 years, if Southern Company is lucky, to complete the construction of these new units and put them into service. Building a new nuclear power plant is a career not an assignment. 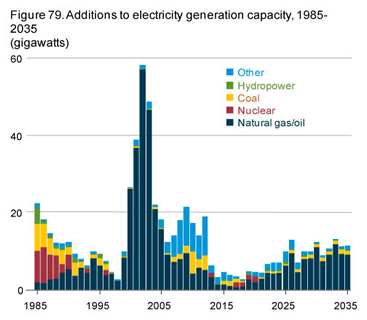 But think of all that has changed in the electric power markets in the US since 1978—or even since 2004 when Southern became a founding member of NuStart, a consortium of utilities hoping to restart the nuclear renaissance. The greatest threats to nuclear power are not safety or regulatory problems—the greatest threats are inflation and delays in construction that drive up the cost of construction. Will that same cycle of inflation and delay hit this new generation of nuclear power plants? We don’t know but it is enough of a risk that combined with low natural gas prices there are few players willing to that the risk. Why are natural gas prices low? We are seeing phenomenal change in oil and gas from the use of advanced technology and oil patch determination in putting horizontal drilling and hydraulic fracturing to work to extract previously uneconomic resources from thin ribbons of oil or gas in shales. This growth in unconventional oil and gas is so powerful that in a few short years it has fully offset the depletion rates in conventional oil and gas deposits and turned America into an exporting nation for the first time in decades. Renewable energy generation grows 33% from 2010 to 2035. Coal generation market share drops from 45% to 39% by 2035 with 33 GW of coal retirements and 14 GW new coal plant. Nuclear power grows by 11% by 2035, but share drops from 20% to 18% with 10 GW new nuclear, 7 GW of uprates, and 6 GW of nuclear retirements. Low natural gas prices are being caused by the growing supply of natural gas that exceeds demand because of a warmer than normal winter and demand reduction caused by the slow economic recovery. As the market fundamentals adapt to new realities we should see natural gas prices rise from their historic lows when the economy recovers and some of that excess supply is exported to higher priced Asian markets as LNG. Low gas prices are an equal opportunity competitor. They hurt coal and nuclear base load generation because natural gas combined cycle is faster to build, easier to site, have lower capital costs and no technical risks unlike new designs for nuclear plants or new technologies for reducing emissions. Low gas prices also hurt renewable energy by driving down the grid parity price wind and solar energy are being forced to face in their evolution to mainstream generation resources. But to be sustainable as subsidies and renewable portfolio targets are achieved wind and solar but be profitable without subsidies at prices competitive with natural gas combined cycle. The stronger the growth in unconventional oil and gas the longer natural gas prices will remain low. And it looks like we are in for low gas prices for the foreseeable future until the enthusiasm of market forces again helps restore equilibrium. The good news is that equilibrium could be sparked by the return of industrial demand as manufacturing and its job creating potential returns from offshore attracted to lower energy prices, better competitive conditions in the US, rising costs in China, the pressure to be more sustainable and stop shipping raw materials and finished goods around the world by instead producing products closer to the end user markets. If low energy prices were combined with reforms in US tax laws to stimulate repatriation of offshore income, reducing corporate tax rates to global competitive levels, providing more regulatory certainty about cost drivers like health care, tax rates, expensing capital equipment the US economy is more likely than not to grow faster and restore equilibrium in both energy and GDP growth. This is a good news story why is it so hard for our politicians to find an equilibrium of their own to pursue it?